For over thirty years, it has been a San Benedetto tradition to build a thirty-foot straw Christmas Cow to honor their Swedish sister city. Even more celebrated have been the ritualistic acts of arson to burn them down (except for the time one was run over by an RV). As the president of the Ladies Aid, Maddie Kosloski’s mother is intent on protecting the sacred cow from those intent on setting it aflame. No one, especially Maddie, could have expected that an attack would come in the form of four gingerbread men, a Santa, and one deadly archer. For while flaming arrows take down the cow, an even more deadly one strikes the other cow protector, president of the Dairy Association Bill Elderich. Maddie may not have entirely appreciated that the Christmas Cow that for one month replaced her Paranormal Museum as the town’s second biggest attraction, but she never wanted its destruction. 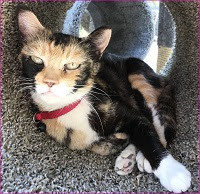 Maddie had vowed to stay out of further investigations, especially since Detective Laurel Hammer seriously has it in for the Kosloskis; although Maddie didn’t set the fire that took off Laurel’s hair, nor is it provable that Maddie’s cat was responsible for the incident that resulted in Laurel’s foot being run over. Maddie’s mother isn’t about to sit idly by, especially when they’re shot at, barely escape being blown up, and nearly get hit by a car. The debate over raw milk, “agrihoods,” affairs, and the very high-winning prize over the cow-burning bet, all ensure for multiple suspects, motives, and a villain still on the loose. This continues to be a hilarious and endlessly clever mystery series. Maddie may be the owner of a museum full of fairy statues, Krampus postcards, and an Icelandic Christmas Ogre cave, but she remains incredibly grounded and reluctant to embrace superstitions. Despite her best intentions to avoid the chaos, it seems to swirl around her. Her recent purchase of Cursed Cow Bells has San Benedetto erupting in paranoia and fear, forcing Maddie to hire a pricey specialist to calm the spreading hysteria. She’s still bruised from her recent breakup with a motorcycle-riding neighbor, but that hasn’t helped to alleviate her crush on the charming Detective Jason Slate. Maddie’s vast array of friends bring their share of laughs and not-so-secret secrets, enhancing their novel while never distracting from the continually evolving plot. From the first page to the very last, this mystery keeps readers glued to the page with humor and extremely witty dialogue. 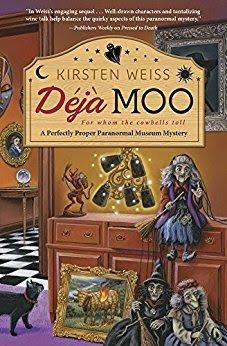 To enter to win a copy of Deja Moo, simply email KRL at krlcontests@gmail[dot]com by replacing the [dot] with a period, and with the subject line “moo,” or comment on this article. A winner will be chosen March 17, 2018. U.S. residents only. If entering via email please included your mailing address. If entering via comment please be sure to include your email address. Thanks for taking the time to review Deja Moo! Thanks for introducing me to a new author. I love the idea of a Paranormal Museum. What a great idea. I would love to visit one myself. Interesting and spooky! Can't wait to read the book. You are the winner-just sent you an email asking for your mailing address. I really enjoy this series. Can't wait to read "Deja Moo". Hi, Marlene Ezell here. This book sounds so interesting. Thanks for the chance to win a copy.